Jordan and Brent. 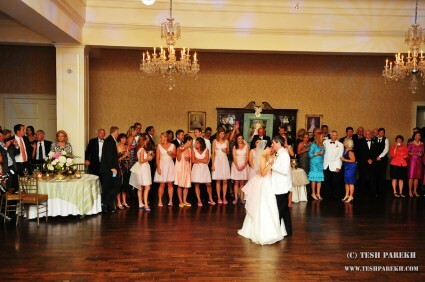 A Carolina Country Club Wedding. 18×24. Oil on linen. I did above painting for the beautiful Carolina Country Club in Raleigh NC. 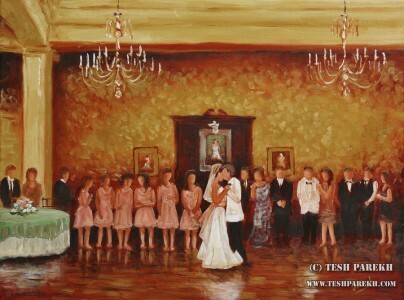 Brenda Whitley (Social Director with the club) had invited me to paint Jordan and Brent’s wedding reception. Couple of years ago I had painted Rod and Amy Brind’Amour’s wedding ceremony and delivered the finished painting to the Carolina Country Club. But, this was my first time doing painting of the club event. I often get the question about painting from photos. Sometimes the question is from the bride who did not know about my live wedding painting service and sometimes the question is from family members looking for a special gift. The answer is- yes, I do accept studio commissions that are done from the reference photos. The painting above was done from the photos that I captured. Due to my schedule, I did not paint live at this reception. I arrived ahead of the first dance and made some pencil sketches and snapped reference photos before the guests arrived. Once the reception started, I stayed close to the stage where The North Tower Band was playing live. I captured the first dance photos for my reference. I am a professional photographer (check out my photography website) and the first dance happens to be one of my favorite wedding day moments to photograph! Back in the studio, I reviewed my reference images. I decided to paint in oil on 18×24 linen. I execute all of my oil commissions on the linen. I also paint in watercolors- those are executed on paper. I liked below image as a general reference. The First Dance. Reference photo for the Carolina Country Club wedding painting. The purpose of a painting is to tell a story. To capture a moment. So, my aim as an artist is to convey this visually using various elements, while being faithful to what I observe. I liked composition of the original image and kept it in the painting. I changed few things to keep emphasis on the couple. I liked the warmth of this moment. So, I toned the linen with warm colors to convey this. My approach to oil paintings is very different from my watercolors. I start my watercolor paintings with a very good pencil drawing (check out my earlier live commission of this year). I start oil paintings by placing larger shapes of the composition. I also create very rough tonal design. Rest of the painting process consists of refining the painting to add details, colors and achieve the tonal balance. All this time, my goal is to keep the focus on my main subjects, in this case- the couple. The couple is also painted in more detail. I worked on this painting over several days. I am happy with the finished painting. It does tell story of the couple’s beautiful first dance. I had also liked below image, but, that will be a subject of another painting some day. The First Dance. 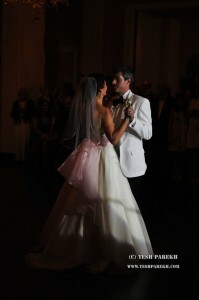 Another reference image for the Carolina Country Club wedding painting.